I was always cleaning up after my kitty as he tracks litter throughout the house after visiting the little cat’s tray. Other days, he seems to miss the pan completely and I am mopping up pee as well. To solve this problem, I began my quest for the best cat litter mat. - Stylish with a cute cat motif. - Great size which can accommodate most litter box and tray variations. - Only water-resistant – but adequate enough because liquids do not pass through the mat to the floor. - Large honeycomb holes in top layer allow litter to fall through. - Thick, cushy fabric which is super soft on kitty’s paws and resistant to wear and tear. 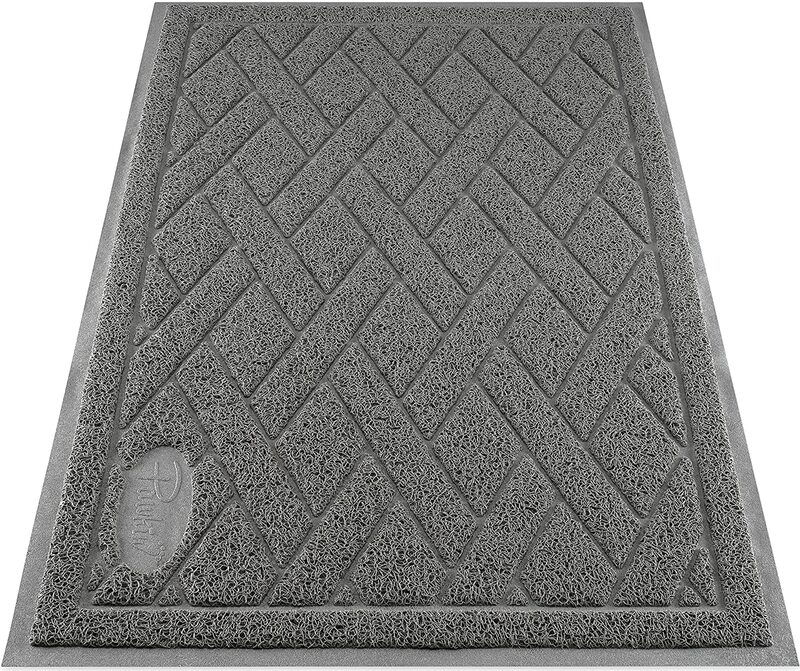 - Tight plastic loops and surface grooves of the mat successfully trap litter and prevent claw snagging. 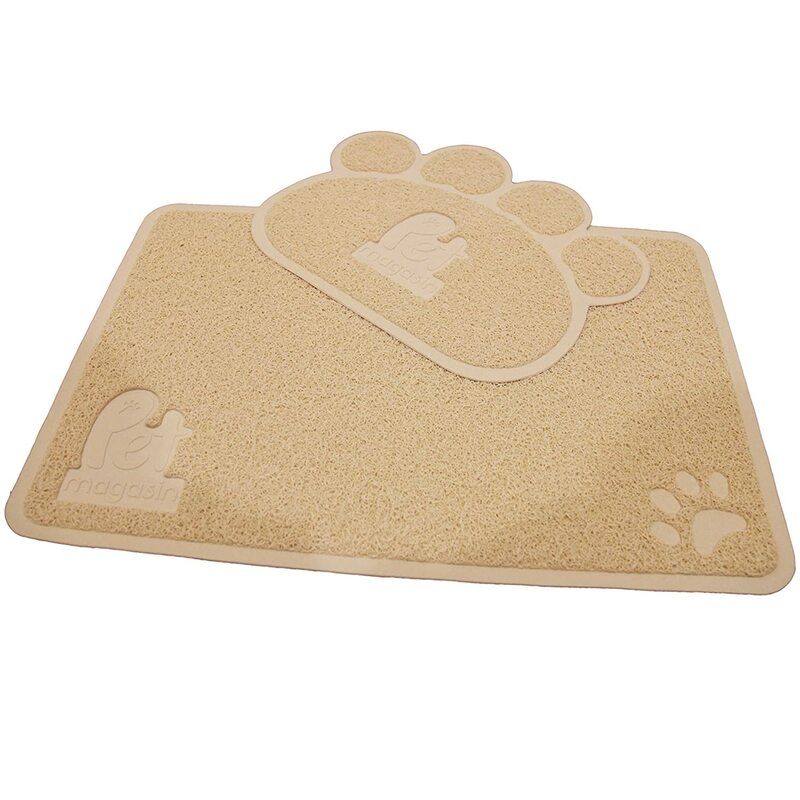 - Smaller mat of set in an adorable paw shape – wonderful for a placemat or as an extension to the bigger mat. SIZE: Extra Large – 35 by 23.5 inches. COLORS: Brown, Black, Gray or Beige. Stylish with a cute cat motif. Great size which can accommodate most litter box and tray variations. Stays in place on both carpets and hard floors. Thick and soft – comfy on your bare feet and kitty’s paws. Handy PDF covering FAQ, general instructions and care included. Groves adequately captures and holds loose litter but vacuuming is needed for removal rather than just shaking. You will need to hose it down with a high-pressure hose in the event of a poo-poo accident as it is very difficult to clean otherwise. Machine washing may cause the mat to bend out of shape. Some cats don’t like the texture and avoid walking on the mat. Waterproof – but doesn’t absorb puddles which you can unknowingly step into. Additionally, urine can dribble off the edges of the mat. SIZE: X-Large - 35 by 23 inches. Pawkin’s Patented Litter Lock Mesh successfully captures most litter. Only water-resistant – but adequate enough because liquids do not pass through the mat to the floor. Trapped litter is extremely hard to remove especially if litter gets wet. Strong plastic odor upon purchase but it does dissipate with time. Tends to retain other smells like cat pee or tobacco despite hosing and washing. Needs to be lifted regularly as it can stick to hard floors. Some cats don’t like the feel of the mesh and refuse to walk on it. Large honeycomb holes in top layer allow litter to fall through. Lightweight enough to easily tip out trapped litter but advisable to do this carefully as you can accidentally spill the litter everywhere due to seams! Cats that mess more than most are provided for as a standard puppy pee pad can be placed securely between the multiple layers. Slides very easily. Applying duct tape to hold it in position will prevent a nasty fall if you are going to be walking over this mat! Although not as difficult to clean, the larger size can only be hosed or folded up with some effort to fit into the shower to be rinsed. Material is porous and may draw in the feline pee odor that you cannot get rid of. Some cats like to chew on the foam. SIZE: 2 Options: XL Super Size – 35 x 23 inches / Jumbo – 47 x 36 inches. COLORS: Black, Light Gray, Lavender, Beige, Brown, or Ocean Blue. 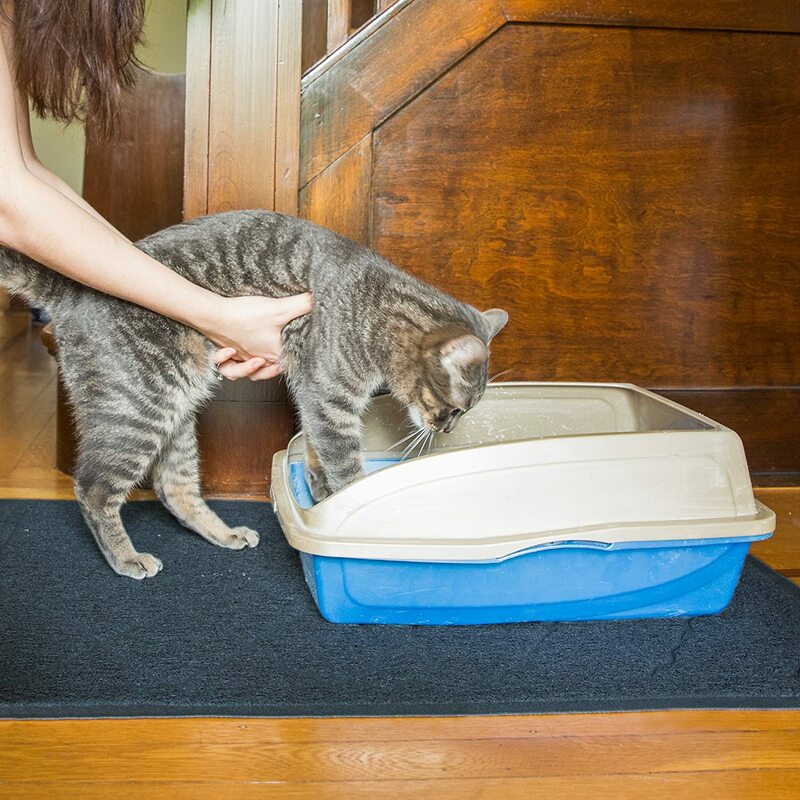 Jumbo mat can comfortably fit two cat litter trays or boxes. Thick, cushy fabric which is super soft on kitty’s paws and resistant to wear and tear. Tight plastic loops and surface grooves of the mat successfully trap litter and prevent claw snagging. You need to remove the mat regularly as the backing can stick to hardwood floors over time and cause damage. Manufacturer recommends it only needs to be vacuumed, shaken out or rinsed but due to its good absorption, cat urine smells may linger. Washing is tricky as it is too stiff to put into the washer and it can take 3 days to dry. Smaller mat of set in an adorable paw shape – wonderful for a placemat or as an extension to the bigger mat. Easier to clean than competitors. Regular sweeping or shaking is effective in removing litter. Hand vacuuming works just as well. 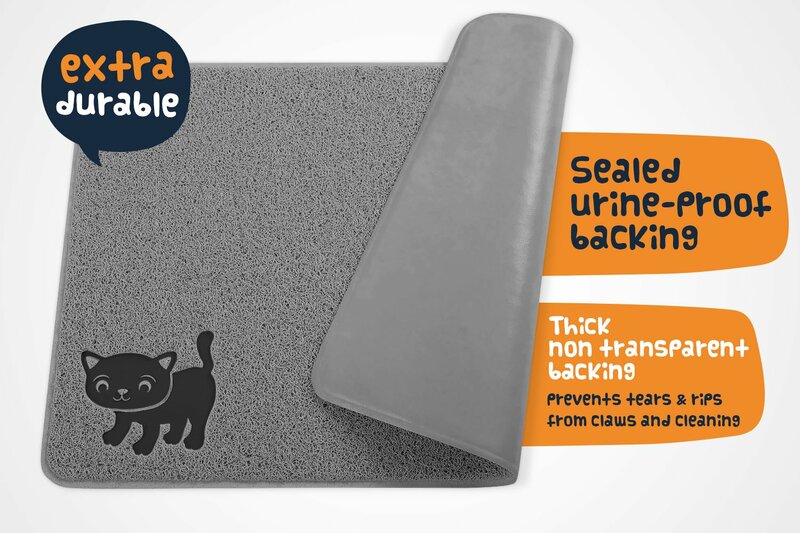 Not as soft as other cat litter mats – definitely not comfortable for barefoot humans and some cats, too. Mat tends to slide on wooden floors despite non-slip backing. Does not absorb liquid so seepage to floor can occur. Too small for many feline litter boxes or trays and cats can easily just jump over the bigger rectangular mats. Why Should I Be Using A Cat Litter Mat? 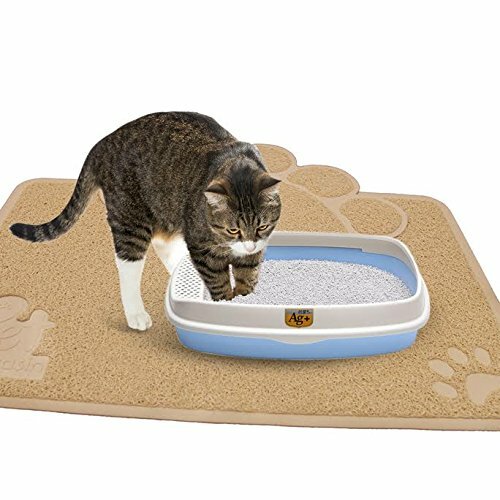 The cat litter mat is placed underneath your feline’s litter box. Although many people use a cut square of a regular mat, these end up looking unsightly and ratty when they start fraying. Furthermore, these can snag on the claws of your cat. There are many benefits making it worthwhile in investing in this useful item. Once you have one, you will be wondering how you ever managed without one! 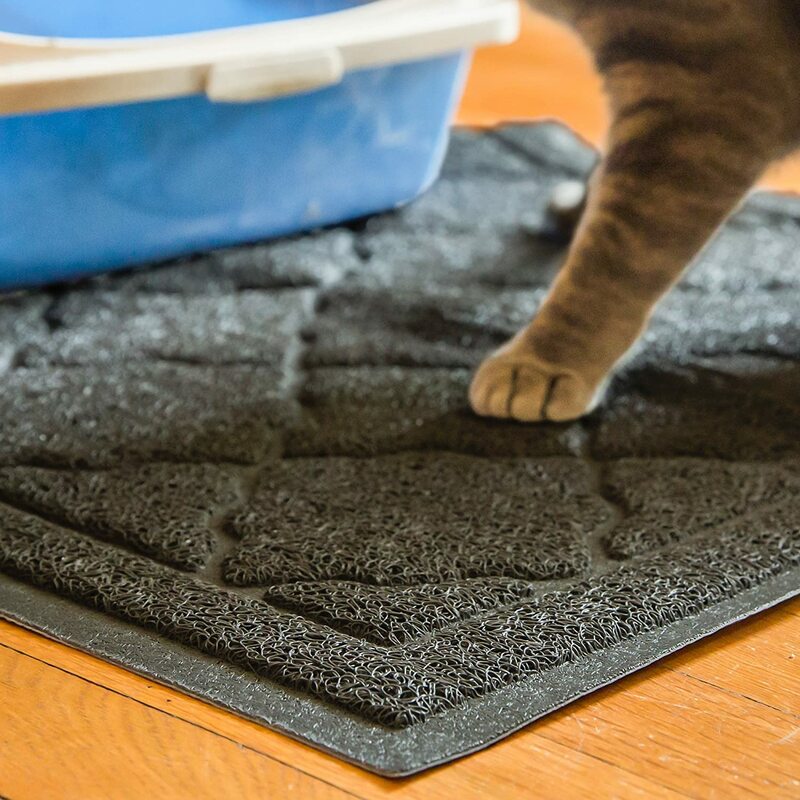 These mats prevent your cat from accidentally kicking litter out of the pan when covering their poop and messing it all over the floor. The same goes for litter sticking to the bottom of their paws which was why I had the reoccurring problem of finding embarrassing litter in my lounge or kitchen when I have visitors over. The mat has totally cut the amount of time I spend cleaning up after my favorite feline. If the pan is missed by your pussycat, the mat will protect your floorboards or carpet from soaking up the urine or stop it from seeping through. Why Is My Cat Missing The Pan? One of the many reasons that your cat may be missing his/her tray is that it is just too small for comfort. You will need to look at a bigger tray with higher sides to further assist in preventing these little accidents from occurring. Think of it as a kitty pee guard. Another solution could be to use a fully enclosed litter box. Although this will help with accidental spillage, a few cats don’t like the confined space and are generally in a huge hurry to get out once they are done inside. This will result in more litter being scattered everywhere around the house but minimize the urine dilemma. It’s a catch-22 for sure. Either way, a cat litter mat will definitely help in both regards. What Should I Consider When Looking For The Best Cat Litter Mat? You need to consider the size of your cat’s litter box or his/her litter tray and ensure that the mat is big enough to allow extra spacing on the side once the box is placed on top. One of the main reasons I got a cat litter mat was to clean less in the first place. It is, therefore, important to look for a mat that is low maintenance and can be cleaned easily as well. Many manufacturers claim that you simply just need to shake them out to remove excess litter. This is not always the case and some mats are so stiff that this can actually cause them to crack and break. To be frank, it is quite a chore to clean most cat litter mats but I prefer this to continuously having to clean up after my Tom. As explained, your floor and carpet must stay dry to be protected. Your mat should have a waterproof backing to prevent pee-pee spillage. Some are only water resistant – many people think it is one in the same. There is, in fact, a difference! You may not think so now but if you have a wooden floor, you will understand the difference all too soon. Remember that mats that do not absorb the liquid will create puddles. Mats should be anti-slip so as to stay put and not to move around unnecessarily. Slipping could result in an accident. The best cat litter mats are those that have a textured fabric that will successfully prevent litter from ending up anywhere else but on the mat. Some mats have the novel feature of grooves across the surface or along the edges that further facilitate this very purpose. 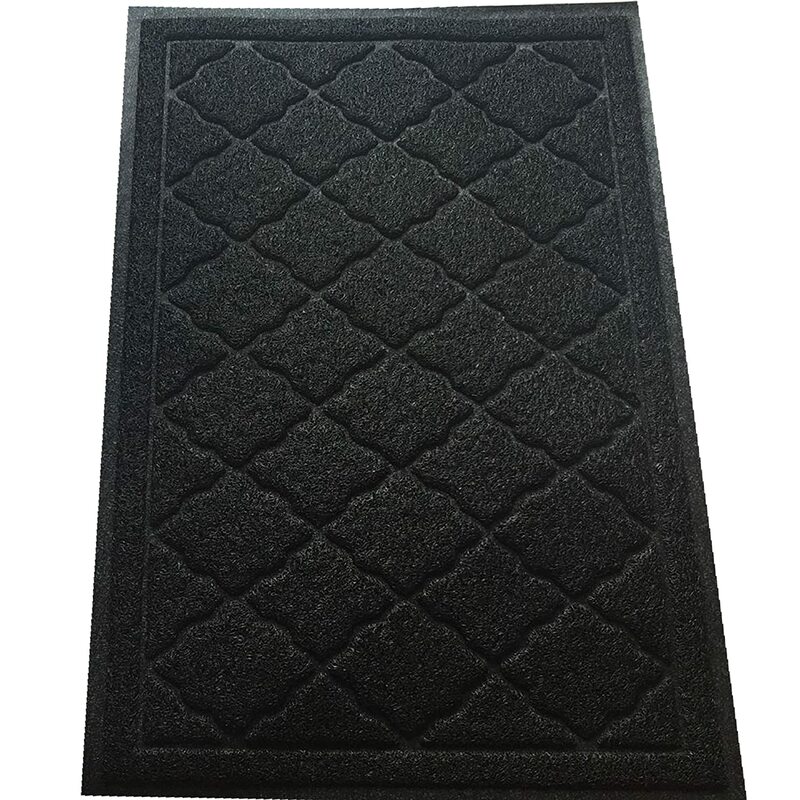 The best cat litter mats are those that have a textured fabric which should not easily hook to his/her claws. Your cat matters, too, in this regard. The fabric should not easily hook to his/her claws. You also do not want a thin, flimsy mat that will suffer wear and tear of regular traffic from those very same claws. Some textures may encourage scratchers or chewers. This may not be a top priority to you as it is to me, but I like it when the décor in my home matches. The colors and look of the mat did influence my favored choice. Simply put, I didn’t want any clashes that would just be an eyesore to me at the end of the day. 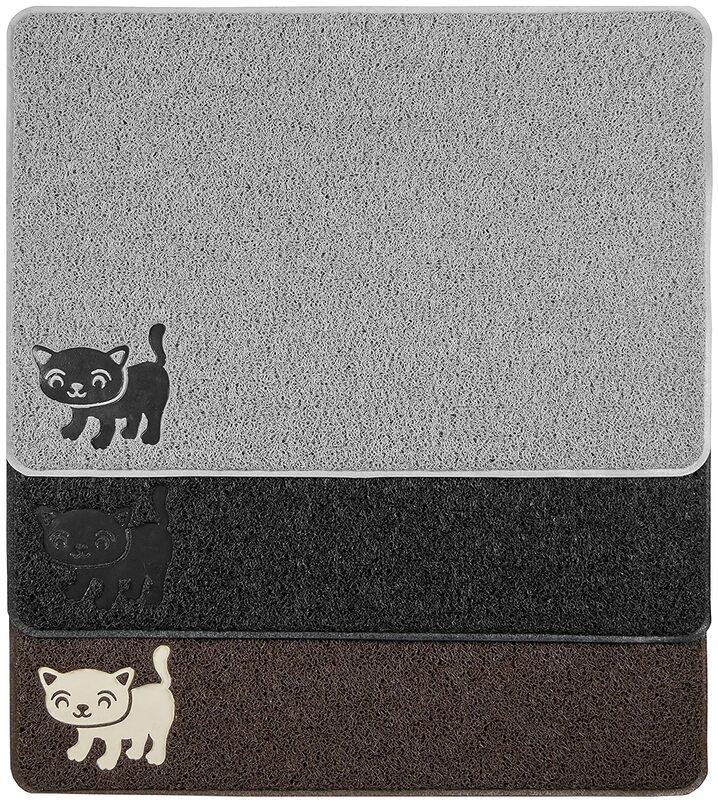 The cat litter mat is a must-have for any cat owner. 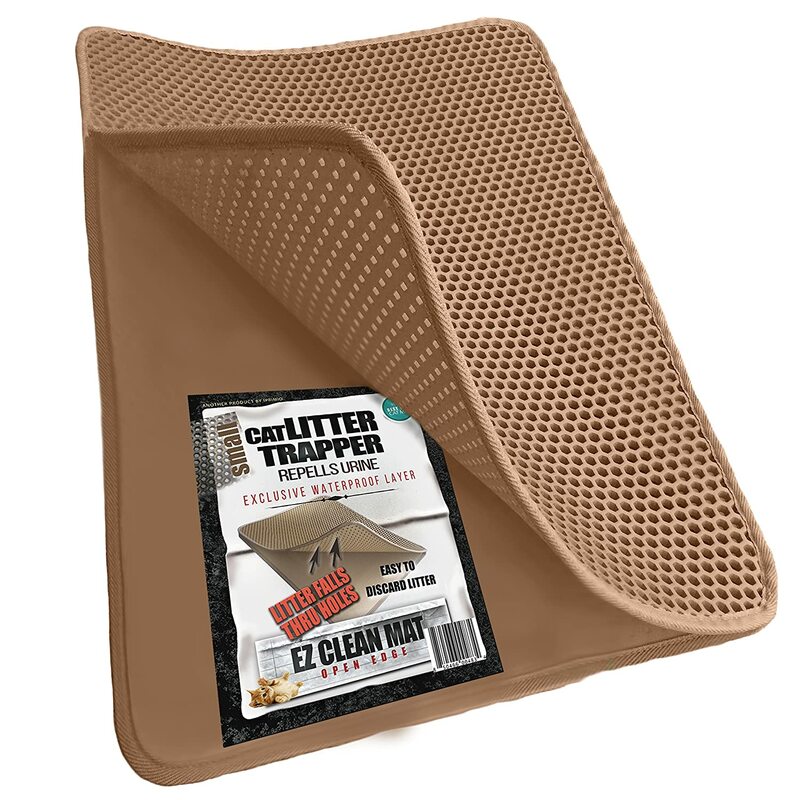 Although all of these mats will definitely help minimize your cat strewing your home with litter like confetti, I must admit that the Smiling Paws Premium Cat Litter Mat is my personal best cat litter mat.